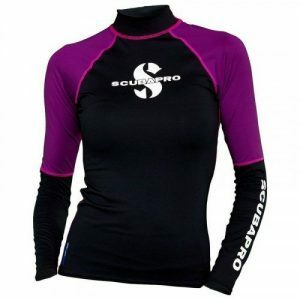 When it comes to protection from the elements, SCUBAPRO's new UPF Collection of rash guards has you covered. Technically advanced and fashion forward, with an eye to details that divers appreciate, the UPF Collection lets you radiate your personal style - before, after and during the dive. Enjoy all-day protection without sacrificing style with a UPF Collection long sleeve RASH GUARD. Designed for diving but perfect for all water sports, these stylish long sleeve RASH GUARDS are made from high quality polyester fabric, are form-fitting, comfortable, and dry quickly. They also provide UPF 50 UV protection, which puts them in the "Excellent" UV protection category. High quality polyester offers nice hand feel and provides good color fastness - especially in the lighter colors. Polyester is comfortable yet durable, abrasion-resistant, and it does a good job of retaining its shape after repeated use. Looks great with the T-Flex leggings. Slimming color panels and cut compliment a female’s body.